There was a tree in our back yard. It had grown from a twiggy shoot when we moved here quite a few years ago, to this majestic stunner with an enormous canopy. Unfortunately the tree had one massive limb leaning over, caressing the house. It was splitting. Winter is coming, and there'll be raging storms. The thought of having the limb or whole tree get up close and personal is unsettling. We called an arborist who confirmed that the tree would need to be lopped. The birds are extremely unhappy, I think they're plotting revenge. All afternoon, the lorikeets were cursing constantly, abusing shrilly and wildly, watching us mulching, telling their cronies that we're bad people. I didn't need to understand 'bird' to get the gist of the meaning! The possums have lost their highway to the roof of the house *thumbs nose at possums - no more galumphing across the roof at night. Sometimes being pragmatic is the safe option, trees are important, but so is our home. The biggest logs are nearly 40 cm in diameter. The strong smell of eucalyptus oil is almost overwhelming, I can fully relate to koalas getting dozy with it. Last night, standing outside watching the first stars appear, the smell of eucalyptus was heady. Indoors, the fire was crackling cheerfully with some of the dryer branches. A glass of home brew - Super stout - in hand; in all, a satisfying day. 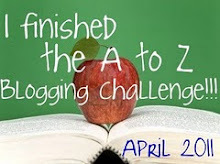 I'm kind of glad The Challenge is over, so I can enjoy a slower pace and find a new direction. It is sad to see majesty toppled - in any shape, but it has to be done. I remember a fellow telling me that koalas actually get 'drunk' on eucalyptus! ...and what a great word - "galumphing" is! Lewis Carroll? Cheers. (clink glasses here). Sorry the tree had to be removed, yet it sounds as if it were necessary. I have quite the reverence for wood, growing alive or not. After all, it was alive at some point. Wood still gives to us after it changes forms, like that cracklin' fire and its warmth. Awww, the birds are gorgeous and I bet they are extremely unhappy; they have a right to be! I think it's sad to see a tree go, but as Spadoman says, it will continue to give to you for awhile yet. your crackling fire and home-brew in hand sounds like a cozy evening. I love the smell of eucalyptus too. have a great week Sue. cheers! most definitely. Bob, I've heard the same thing about koalas, but I'm not sure how true it is. They can certainly put up a very loud fight when threatened, and those claws can do a lot of damage! My dictionary doesn't have galumphing in, but it describes possums on the roof perfectly don't you think? Spadoman, cheers! there's another chilling in the frig if you'd like to drop by. It really hurt needing to lop that tree, as well as another one in the front yard. Our neighbour came over and commiserated with me. I love timber, the feel and smell and grain, it's an amazing lifeform. I wish the Tasmanian government wouldn't sell the old growth forest for woodchip, it's dreadfully shortsighted. Tracy, they've gone quiet today, and I'm sure they're plotting revenge...I'm just not sure what it is, or when they'll strike! Becky, lovely to see you, there's plenty of home brew for all my bloggy friends including non alcoholic, and the fire is crackling in a cheery way. I just realised you probably know a lot more about eucalypts that I do! Hi Bob, you were right, galumphing is from Lewis Carroll's Jabberwocky! And the prize is ... ? ... er, another glass of stout? It really is very good! "chink" of glasses all round. 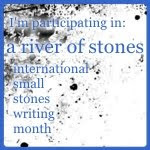 I just came upon your blog thanks to Arlee Bird's site. 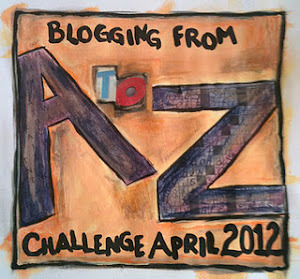 I wish I had discovered it during the A-Z Challenge, but I'm glad to have found it now. I've enjoyed catching up with your posts, and I love blogs with photos so I'm looking forward to following. I'm sorry this tree had to come down, but I couldn't help but smile about the birds plotting revenge! Poor things. I love their picture, what beautiful birds. I loved the pics and the story. I think this is one of the first non alliteration things I have read of yours. I truly am liking it. 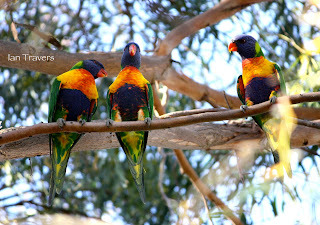 Hi Sue .. thanks re the lorikeets pic .. yes Mum would love to see them .. her eyes are ok .. yet they're not - something I've adjusted to .. in fact they've got better if anything - the brain does heal. She struggles with focussing I think. I do take the laptop up - but again it's difficult to work as well as care and adjust to Mum's wants .. I'd like to get an ipad .. but not for now. Glad the tree is down .. but sad for the birds ..that eucalyptus smell is enveloping isn't it ..
Dafeenah, thankyou, I suspect that the drabbles tap into a different area in my brain, as I think and process very differently when I write them. Hilary, hopefully you have heard from me! Hi Sue .. had to go up to my Mama .. and yes I did get your email and have just replied - lunchtime here.